People often ask me why I make so many vegan recipes. There are actually tons of reasons, one being that I have several vegan friends, so I frequently cook for them. But the second reason is that so many kids today have allergies to a variety of foods, many specifically to dairy and eggs. Since vegans don't eat any animal products or foods made by animals such as honey, these dishes are good for some kids with specific allergies. I made these pancakes for a bunch of friends who aren't vegan and they didn't know that they were dairy and egg free until they had cleaned their plates . Light as feathers, but with tons of depth of flavor and added texture from the spelt or buckwheat, these pancakes are a real treat. I actually served them for dessert later that night and the kids had a blast eating them with their hands and dipping them in syrup. See, pancakes really can be enjoyed morning, noon and night! 2. Mix the wet ingredients in a separate bowl. 3. Add the wet ingredients to the dry ingredients and whisk to combine (don’t over mix, some lumps are fine). 5. Ladle as many pancakes as possible (about 2 tbsp of batter for each one) on the griddle and cook 2 minutes or until bubbles start forming on the surface and the bottom is golden brown. 6. Flip the pancakes and cook another 2 minutes. 7. Repeat the process until you run out of batter (you can hold the finished pancakes in a 250 degree oven while you finish making the pancakes). 7. Serve with maple syrup and enjoy. *Allow to cool, place in a ziploc bag, label and freeze. When ready, place in toaster oven or oven at 300 and heat for 10 minutes or until heated through. My little guy is loving these! I have made three batches already! If we don't have buckwheat or spelt flour, do we just use 1 1/2 cup of white flour?? And if we're not vegan, we can use regular milk in place of the rice/soy/almond milk?? These were so good!!! I put just a splash of vanilla extract in with the wet ingredients, and I also sprinkled a few vegan chocolate chips on these once in the pan. Absolutely fantastic!!! Thank you for sharing!! Very yummy! I added a touch of vanilla extract, a bit more milk and used whole wheat flour instead of white, along with spelt. Thanks for posting! Thanks for this recipe! I made a gluten free version by using 1 1/2 cups GF all purpose flour (a mixture of rice, potato and tapioca flours) and 1/4 tsp guar gum instead of the white and spelt/buckwheat flours. I used plain almond milk for the milk, grapeseed oil for the batter and olive oil for the pan, brown sugar instead of maple syrup, and added more spice (at least double the cinnamon and added approx. 1/4-1/2 tsp each of nutmeg, cloves, ginger and all spice) because I like mine very flavourful. I resisted the urge to thin out the batter more and timed them 2 minutes on each side like the recipe says, and they turned out great! 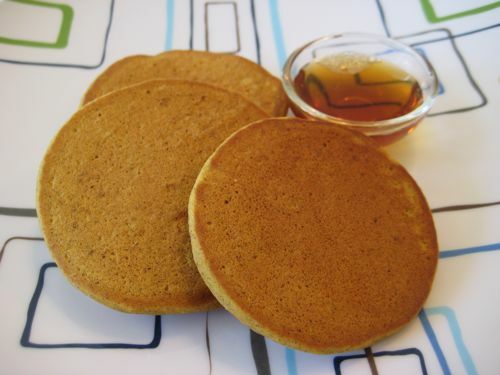 Nice, tasty, fluffy pancakes that are gluten, dairy, soy and egg free -- how wonderful is that! These are the most delicious EVER! I used skim milk because I was all out of almond and came out great! !My 5 toddlers LOve Love Love thesea and they ALL cannot get enough! So light, fluffy and moist that you really don't even need syrup~ my husband requests them more than the kids! :) Thanks so much for another great recipe!! A friend passed along this recipe and I am excited to try it, as well as look around at some of your other delicious-looking recipes. I'm always looking for new, healthy recipes for me and my four kids and husband. Thanks! Thank you jacqui sounds great I'll give it a shot! Question: if I'm not a vegan can I use regular whole milk instead of the rice milk? Or will it screw up the recipe? I always use whole milk to make these for the pumpkin-lovers in my house. I think I have made these a dozen times over the last few months. Thanks for a great recipe!! I tried the recipe and loved it! Can you substitute a fruit for the pumpkin? We're having a Valentine's Day party for my son on Saturday and one of hte little boys has a dairy allergy so I'd like to use this recipe with something like red raspberries. I'm not vegan but these pancakes sound great! However, if I don't have spelt or buckwheat flour can I use all purpose flour? These were delicious!!! New favorite pancake recipe. I also added cacao chips and bananas. Love that this is also low sugar. Thanks! Thank you for these recipes. I have to further modify them to make them safe for my DD but we love them. Lindsey, I use whole wheat flour to replace buckwheat flour. I plan to make these in the morning! I also wanted you to know I am grateful for every vegan recipe you post as my son is allergic to milk and eggs. What a delightfully refreshing pancake recipe! Loved it. I was in the process of making these when I went to my pantry and realized I was out of pumpkin. No problem! Mashed banana worked perfectly! Such a great recipe. So versatile! These were yummy and healthy. My 4 year old and husband both enjoyed them. For some reason I had trouble with them sticking to my pan (an iron cast skillet) so next time I will try the nonstick pan. Thanks for the great recipe.